Without fail, every time it is early in the morning or late at night and I am out in my woods and back gardens with dogs in my nightgown, something funny or magical happens. Last night it was a great owl hoot hooting from high a top the trees and this morning? A hot air balloon. Yep. A hot air balloon. Around 7 AM. Looks like a solo flight. Not sure where they came down in the end, thought it was going to be the cornfield next to our woods, but they bounced back up and sailed over and onward. We never get hot air balloons over us so I wonder where they took off from for their Easter morning flight. What we usually get are helicopters (military and helicopter museum variety) and small planes. It was so funny this morning. I was one the edge of the woods looking further into the woods and I kept hearing this sound. Sort of like a big whoosh whoosh. I looked around, saw nothing. Looked up and there it was, the Easter sunrise balloon. Given the time I saw them, I would say they went up when the sun was rising and how beautiful that must have been. To whomever the pilot was, thank you for my Easter surprise. It was fun watching you float by. Happy Easter everyone, enjoy the spring day. from the humble to the fairy tale fantastical: chester county needs more preservation of land and architecture. I had all these photos from Chester County Day this past October that I had never edited. Life got busy, along came the holidays, and here we are, months later. But I do not know that now is a bad time to be editing. Actually, I think it is the perfect time given my recent posts on preservation. And Chester County Day is the perfect tour day to go around the county and see what makes where we live so magnificent, so special, so worth preserving and fighting for. Our architecture ranges from the humble to the classic farmhouse to the fantastical. We need to preserve this. We can’t continue to allow the hum drum homogenous plasticity of dense developments to continue to run rough-shod over our county. If elected, appointed, and county planning officials aren’t going to help, we have to seek alternative means. For example, when will we see these crazy developer driven zoning overlays that walk, talk, and smell of spot zoning go away? It’s hard. We stand up in our communities and we become targets. Literally targets. For defending what we love. This afternoon, the Philadelphia Inquirer landed a whale of an article for 5 PM release online (give or take, as far as time goes.) It speaks to what people are going through. The article is about Lloyd Farm in Caln. The article describes in great detail what people in Caln are going through. And they are, of course, but one municipality dealing with these issues. 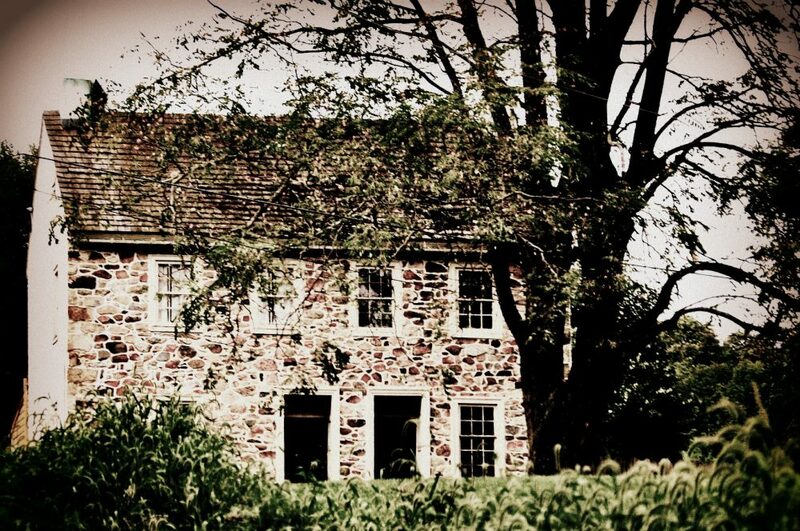 The Lloyd farmhouse is older than the nation. Caln Township residents are fighting for its survival. The Lloyd farmhouse in Caln Township has a star-studded genealogy, a background that reads like a who’s who of American history. William Penn himself sold the land it sits on to a wealthy family, a grant that paved the way for the creation of the state. A century later, it became an unofficial stop on the Underground Railroad, according to local histories of the pipeline to freedom. All the while, its caretakers maintained crops that state historians have described as an early example of the agriculture that would come to dominate the region. But after years of deterioration and multiple owners, the 1757 building’s history is coming to a close, unless a frantic scramble by residents and local historians can stop it. They’ve embarked on a last-ditch effort to grant the farmhouse historic status, working against the demolition permit its owner has received from officials in this central Chester County community. It’s a very long article. That is but a small excerpt. Read the whole thing. It’s beautifully written. This article tells the tale that can be superimposed over many municipalities. East Goshen, West Chester, East Whiteland, West Whiteland, West Vincent, Upper Uwchlan, Westtown, Willistown, West Goshen, Caln…the list is as long as there are municipalities. Humble and affluent communities alike. Going through these photos a few months later was like having fresh eyes. Some of my photos were of houses on the tour, others were of things I saw along the way. Things that break my heart like a development rising behind a corn field. It’s like a trick of the eye. It’s eerie. Or what about the water in a fountain of a bucolic estate rising and falling in the fountain with an office park off in the background? Where we used to see fields, we see development. Where we used to see fabulous 18th and 19th century Chester County farmhouses , we see development. Everywhere, we see development. When I look at all the wonderful architecture that is representative of our county from the dawn of the American Revolution, to the industrial revolution, Victorian and Edwardian splendor, humble to fantastical and everything in between it is almost like you can’t breathe because it is SO spectacular. Then you can’t breath because every time you turn around something is being bulldozed and fields of cookie cutter samey same Tyvec wrapped homogenous architecture that won’t stand the test of time is rising up in its place. Have you ever visited one of these developments as they are being built? You can sometimes literally smell the plastic Lego Land of it all. Our history and architectural heritage and open space can’t always belong to the bulldozer and the wrecking ball. Chester County deserves better. Enjoy the photos. I sure did going through them again. I don’t know what it is about early Sunday mornings. It is always when I have gotten some of my best nature shots. I don’t know if it is because the world is a little more still, or just dumb luck. That squirrel loves to sit on top of Buddha. Yet until this morning he never sat there long enough to get the shot. Sunday mornings early have always been among my most favorite times to be in the garden. Today is wet and damp, so I am looking and taking photos from my windows. Some of my bulbs are starting to emerge. But I do not know where all my snowdrops are just yet. I have planted so many over the past few years, yet have thus far disovered none. Watching my birds, gazing over the garden in her winter structure is a very peaceful thing. It’s a great way to envision what you want to do when the weather warms up and I just love watching the birds and critters. I was rewarded with actually being able to photograph one of the hawks. Stay dry today! Thanks for stopping by. Anyway, if you follow their Facebook page for You Bet Your Garden With Mike McGrath you get all sorts of fun stuff to check out and learn…just like by listening to his shows. So today I spent time chatting with Mike McGrath (inner gardener and outer gardener are completely geeking out now all hope is lost!) Yes ME. Ordinary rabid gardener ME. He is SO cool. He is every bit as welcoming and nice as he sounds on the air when you listen. Having had a rather different experience this week when I was on a local talk radio show after being asked to call in, this was a welcome change. It was like he was sitting at my kitchen table having coffee. So we talked about growing tomatoes and I learned something new which was super cool . And we talked about my closed gardening group Chester County Ramblings Gardening Group. Now I did not get to get his advice on Bishops Weed and ask whether or not there are actually true red cyclamen or if growers just feed pink ones dye. I did not get to tell him about my favorite seaweed feed Irish Organic Fertilizer…. Which is a bummer. I admit I kind of did a wee short circuit like a teenage fan girl of David Cassidy or something. Dork city in other words. BUT nevertheless apparently I am on the show they will air on February 23. Where can you listen to YBYG? Glorious Shade is her book and every gardener should have a copy! Suzy Bales who passed away in 2016 – two books in particular Down to Earth Gardener: Let Mother Nature Guide You to Success in Your Garden, The Garden in Winter. My unexpected pen pal for a short time when I wrote to say thank you for her garden writing. Her books can be found with used book dealers on Amazon and other places. David Culp – The Layered Garden – I have a layered garden in places so his book was invaluable. Haven’t seen Brandywine Cottage in Downingtown would love to – here is his website. Monty Don – Gardener’s World Magazine and BBC show. Author of a whole slew of books. I own Down to Earth and The Complete Gardener. Other influencers? Some of the growers and nursery folks I know. And gardens I have visited and gardens I have had. My current garden is a little bit of all of those. Black Creek is my spot for herb plants, vegetable plants, old fashioned perennials and annuals that no one else has and much more. They also sell supplies and tools fairly reasonably. They are the only place I will buy a pre-made hanging basket from. The best times of year to go? Spring until full-on summer hits and then the fall. The greenhouses are PACKED with plants. Yellow Springs Farm is owned by Catherine and Al Renzi. Native plants organically grown and I have planted with them through three gardens. Catherine helped me do my first sort of riparian buffer. And they raise goats for award winning goat cheese. Go Native is so cool. The owner literally forages in woods all over including places like West Virginia for seed and seedlings. I have bought Chestnut and Burr Oaks from them and they have a micro species called an “Amish Walnut” which when cut has a tiger grain – it is a natural cross between a walnut and I forget what but you only find them in Lancaster County. Rhododendrons Direct in Oregon http://oregonrhododendron.com/ Yes you can visit if you go across the country. The guy who owns it is named Jim. He had all my crazy red rhododendrons I wanted. His shipping is impeccable and plants are flawless. Camelia Forest Nursery https://camforest.com/ Ok in NC and you can visit I have only done mail order. There was a winter hardy Camelia created by Morris Arboretum years ago I wanted they grow Sochi tea plants. Applied Climatology at the West Chester Growers Market appliedclimatologyllc@gmail.com -they are on Facebook and in season you find them Saturdays at West Chester Growers Market https://www.facebook.com/AppliedClimatologyLLC Chris Sann is a walking encyclopedia of plant interesting – he is like my gardening father. And I have gotten some amazing plants from him. He gets me to go out of my comfort zone and try new things like green Japanese peonies. New Hampshire Hostas https://www.nhhostas.com/ in person and mail order – only have used mail order – also great plants. Unusual cultivars and old favorites. West Chester Agway. Matlack Street in West Chester. They are so awesome and great plants, garden ornaments, supplies, garden carts and more. They also have a Facebook Page. Uhler’s Feed & Seed Lancaster Ave Malvern. Plants. Supplies. Bird seed. Love them. They have a Facebook Page. Somerset Nursery – Two locations to blow your mind Glenmoore and Zionsville. Please note I list the resources I have used as a regular customer. I am not compensated for my opinion.